There is no denying that we are heading into the height of the summer season. It is true that we generally get off easily compared with many localities when it comes to high temperatures. Sadly that comparison is not enough to keep me from complaining about the heat. I know upper 80s here is nothing compared to a sultry summer evening in the Everglades. But really, does appreciating that I’m not in the Everglades make it any less hot? I think not. 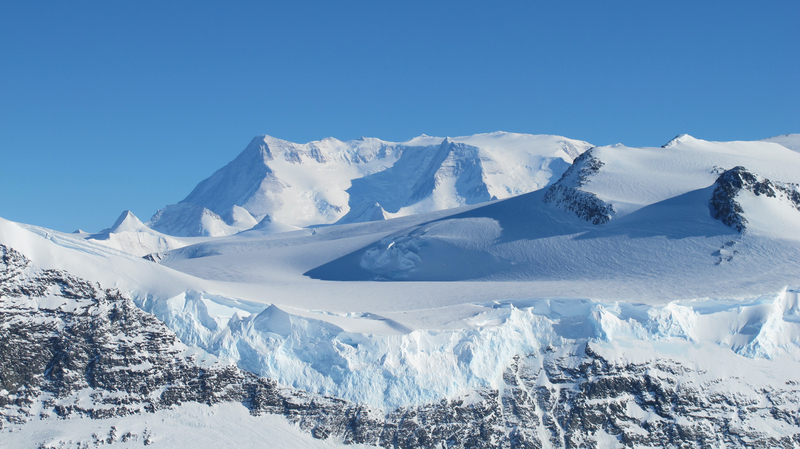 In order to compensate, or perhaps due to the daily gusts of frigid air from the cooling duct in the Reference office, my mind has recently been contemplating the frozen continent of Antarctica. Since most of us have not had a chance to visit, Antarctica is one of the last blank spots on the map. This allows us to project all sorts of ideas onto the southern pole. For some there is an Antarctica inhabited by the noble Emperor Penguin, whose exploits we follow in both moralizing animated and documentary form. For others, Antarctica is a continent on the verge of collapse due to global warming and human exploitation. For me though, I’ve always held on to the image of Antarctica as the cold, brutal, and isolating environment that has tested those who have tried to endure there. The perfect example of this view of Antarctica is the early 20th century race to discover the South Pole carried out by the dueling expeditions of Robert Falcon Scott and Roald Amundsen. In the short-term, Amundsen definitely won the prize. Not only did he get to the pole five weeks ahead of Scott, he actually survived the trip back. In an interesting reversal of the maxim that the winners are the ones who write history, however, Scott and his doomed expedition definitely won the award for most written about and discussed, albeit posthumously. If you want to sample some of what’s out there why not start with The Coldest March: Scott’s Fatal Antarctic Expedition by Susan Solomon. All the heroic (or depending on your view, foolhardy) details are included. My favorite being Lawrence Oates’s final words as he departs the tent to his certain doom: “I am just going outside and I may be some time”. Talk about a stiff upper lip. If you want to get a little more perspective, why not try a biography of Scott such as the excellent Scott of the Antarctic: A Life of Courage and Tragedy by David Crane. Not all is doom and gloom in the effort to explore Antarctica however. The members of Scott’s party that did not attempt the pole, led by Victor Campbell and dedicated to scientific research, actually survived the ordeal. Their harrowing tale is expertly told in The Longest Winter: The Incredible Survival of Captain Scott’s Lost Party by Katherine Lambert. The teams led by Ernest Shackleton, who headed expeditions before and after Scott, also survived after many hardships. Their exploits are detailed in The Lost Men: The Harrowing Saga of Shackleton’s Ross Sea Party by Kelly Tyler-Lewis and Endurance: Shackleton’s Incredible Voyage by Alfred Lansing. Even if you aren’t into the history of Antarctic exploration, you may want to check out two related books of photography. Both Scott and Shackleton took photographs on their expeditions and two recent books put these pictures together: The Lost Photographs of Captain Scott by D.M. Wilson and The Heart of the Great Alone: Scott, Shackleton and Antarctic Photography by David Hempleman-Adams. The black and white images are impressive on their own but they also have a haunting quality, especially when you consider the effort put into actually taking them in such extreme conditions and the history of the expeditions. Finally, if you don’t mind hitting the road, well taking a ferry actually, you might want to check out an exhibition currently at the Royal British Columbia Museum in Victoria titled Race to the End of the Earth. This traveling exhibition is chock full of original artifacts, photographs and even has a life-size replica of Scott’s hut at Cape Evans. This entry was posted in Book Lists, History, Nonfiction, Science & Nature and tagged antarctica, exploration, Roald Amundsen, Robert Scott, south pole by Richard. Bookmark the permalink.